Great Recessions! Debt Ceilings! Fiscal Cliffs! Run for the hills! AAAAAH! Scrub away the façade of apocalyptic doom and, to many, economics is a dull and often mystifying topic. Before you spend hard-earned cash on seed banks and toilet water recycling kits, it would be wise to invest a little time into learning about economic theory and history. But where to start? And more importantly, how to stay awake while researching? Michael Goodwin’s graphic novel, Economix, seeks to fill in the wide gap between fear-profiteering, 24-hour cable news stations, and dreary, soul-consuming Economics 101 courses. Goodwin unapologetically takes a moderate-to-liberal viewpoint on economic theory. Much of his criticisms are reserved for the undue and unnecessary suffering of the poor and middle class caused by unchecked greed and corruption in the business and financial sector. Drudge Report junkies are likely to reject this book outright and dropkick it into the nearest dumpster. That’s a shame because economics is the most discussed news topic over the past few years; an enjoyable layman’s economic guidebook is an essential addition to any voter’s bookshelf. Economix covers economic history from Adam Smith to Occupy Wall Street, although all of the time before the Great Depression only encompasses the first third of the book. Economix focuses heavily on the United States’ economy although it does provide brief overviews on other countries such as the Soviet Union and post-war Japan. Michael Goodwin deftly breaks down systems such as capitalism, socialism, and fascism. His analysis of subjects such as the Great Depression, the New Deal, and the Great Recession deliver the facts with surprising depth and nuance. Goodwin delivers a particularly biting critique on post-World War II media, which he describes as the “Big and Bland” mouthpiece of corporate interests. I’ve heard many of these critiques before, but somehow seeing a snickering corporate robot dropping a bucket of cash on think tanks and television stations drives the point home. Before Michael Goodwin jumps into Ronald Reagan’s supply-side economics, which has dominated the United States’ economy for the past thirty years, he feels the need to justify his political stance. Here Goodwin says he took political stands throughout the first portion of the book, but they are now the popularly accepted by most Americans, so they do not seem political. He goes on to explain that today’s justifications for our grossly inequitable distribution of wealth will fade away with history much like other failed political positions. Meaning his side will be widely accepted as historical fact. While I personally sympathize with his political leanings and actually agree with that statement, it’s an arrogant opinion to present and misplaced in this book. That one page is potentially a huge turn-off point for many readers. Open-minded conservative readers who make it to this section would be justified for slamming the book shut. I can only imagine my reaction if I were browsing a Bizarro-world, neo-con version of Economix and saw the author drawing historical debate parallels between Keynesian economic theory and pro-slavery arguments. I still recommend that anybody who wants to learn more about economics, but isn’t ready to dive into the migraine-inducing treatises on the subject, give this book a shot. If the author’s opinions are unpalatable, then simply gloss over the parts where he pops-up in cartoon form. That’s a clear indication that Michael Goodwin’s about to chime in with his own take. Dan E. Burr’s art is simple and cartoony, but effectively portrays Michael Goodwin’s script. Burr’s caricatures of historical and current public figures are uncannily hilarious. The cartoon style is reminiscent of the Annie Leonard’s Story of Stuff videos with its clear and simple symbolism. Burr performed an amazing Jedi mind trick here by presenting frustratingly inaccessible concepts in a light and fun manner; the art instantly draws readers into the material. Economix’s bibliography is a veritable treasure map of economic knowledge. Michael Goodwin lists every book that influenced this comic along with a brief commentary of each book. Goodwin’s website (www.economixcomix.com) also has a short comic strip about Social Security that follows the same educational and humorous format of Economix. In fact, the free Social Security comic strip is an excellent preview of what to expect from the book. I took two semesters of economics courses in college and Economix, by far, makes the subject more digestible than the monotonic onslaught of supply and demand charts. In these times of regularly-scheduled, hyper-partisan economic crises, this graphic novel is an invaluable source of information for anybody who wants to learn what all these economic terms and principles actually mean. Michael Goodwin’s opinions are liberally biased, but his descriptions economic systems and principles are fair and honest. For the most part, his opinions are visibly separated from the facts. Goodwin masterfully presents some very difficult and dull ideas in an entertaining way. 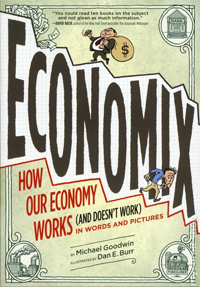 Economix is an approachable book for anybody who wants to broaden their understanding of economics beyond what the evening news delivers. You see, mom, comics are educational.